Tearful resident: "We have a hard time getting through any conversation on this"
MOORHEAD, Minnesota (CNN) -- "It's horrible, it's horrible. We've been crying for two days," says Pam Johnson as she scans her flood-ravaged home. 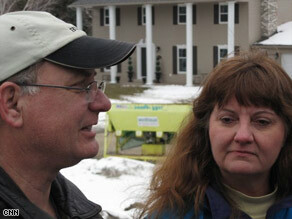 Jon and Pam Johnson paid their home off recently, only to have it flooded over the weekend. Her front lawn looks like an ice skating rink. Her split-level home is surrounded by the now frozen floodwaters of the Red River, the slush seeping a couple of feet high onto the main floor. She and her husband, Jon Johnson, are lifelong residents of Moorhead, a town of about 35,000 located along the Minnesota-North Dakota border. The Red River Valley has been hit by massive flooding over the last week. Nearly all of the towns' homes were spared by the raging floodwaters. The Johnsons' home wasn't among them. "The closest thing I can compare it to is losing a close relative," says Jon Johnson. "That's the feeling." Breaking down in tears, Pam Johnson adds, "We have a hard time getting through any conversation on this." As the couple stood outside the home, a neighbor sought to console her with a hug. "Pam, I'm sorry," he said. The Johnsons fled the home just after midnight Thursday after pleading with city officials to have more homes, including theirs, guarded by a contingency dike. Instead the dike was constructed next to their house, leaving it unprotected. That decision, they say, is perhaps the most painful part of their loss, one that sealed their home's fate. Pointing just down the road, he says he told officials, "Let's put the dike down there. Let's save these houses too. They said, 'This is the best spot. We're going to put it right here.' "
And that's what happened. Emergency workers built a contingency dike just south of the Johnson home and two other houses up the street. The swollen Red River made a fish-hook move, turned south and flooded the Johnsons' home, as well as their two neighbors' homes. The contingency dike stopped the floodwaters and spared the rest of the neighborhood. "I feel that our house was sacrificed to save seven or nine houses ... further on down," he says. It's unclear yet if their home is a total loss. The river slush has destroyed carpets, appliances, cabinets and other things throughout the home. They're unsure the condition of the home's foundation. The couple did manage to save some items like old photos and other important keepsakes ahead of the flood. The Johnsons lived in the home the last five years, and they recently paid it off. Their roots in the neighborhood go back even further. Pam Johnson grew up in the home across the street and married her husband in that same home, which survived the flood. The Johnsons say they likely won't stay in the home anymore, but they hope the area gets help to build permanent dikes. "I don't want to look at it," adds Pam Johnson. "I don't want to touch it. I just want to get my stuff out of there."